The paper undertakes an empirical analytical assessment of some of the determinants of economic growth in the EU during the past decade, with a specific focus on the Central and Eastern European (CEE) members of the EU. The methodology is based on a combination of different statistical methods and techniques including descriptive statistics and stylised facts as well as some widely used empirical models of growth, including the testing of convergence hypotheses and running panel growth regressions. 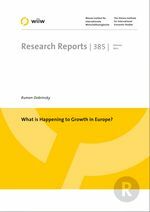 During the decade prior to the global economic and financial crisis, the growth model in the EU was disproportionately skewed towards the attraction and mobilisation of additional resources as compared to the reliance on structural supply-side factors. In particular, EU growth on average was extremely finance-dependent and debt-intensive. The ensuing debt crisis in the euro area rejected this growth model on the grounds of its unsustainability. The current debt overhang implies that countries (both governments and businesses) will have to learn to live with less resources (in the first place financial) at their disposal. Thus one of the key factors for invigorating future growth could be raising the efficiency of resource utilisation, including the utilisation of public funds. Growth in the CEE countries was also finance-dependent and debt-intensive but, on average, not to the extent observed in the older EU Member States. CEE economies relied on improvements in structural supply-side factors such as productivity, innovation and competitiveness to a larger degree than was the case in the older EU members. Thus CEE countries may have a larger degree of policy freedom to deal with the implications of the crisis. The paper also addresses some policy issues related to the possible invigoration of economic growth in the EU and, in particular, in CEE. It suggests that one of the areas of policy reforms that could invigorate growth is that targeting improvements in the efficiency of financial intermediation and more efficient allocation of financial resources. The paper also discusses some supply-side structural measures that appear to be especially pertinent to the CEE economies.